Nine members of the Court will hear arguments for and against the decision. Speaking to reporters at the entrance to the courtroom, Zoabi said that there was “no basis for banning me. Doing so will be banning representation of Israel's Arab population in the Knesset.” The Court will render its decision on Sunday. The decision to de-list Zoabi from the Balad candidate list came several weeks ago, after a request to do so by MK Ofir Akunis (Likud) to do so was approved by the Knesset. 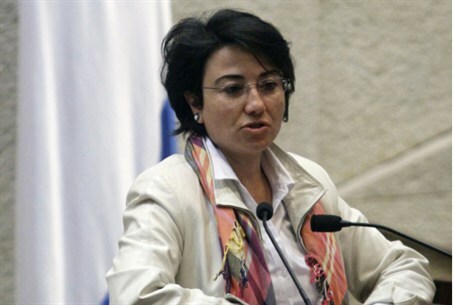 Akunis filed the request to disqualify Zoabi, he said, because she did not support the existence of the state as a Jewish and democratic entity, and because she supported the armed struggle of the Arabs against the existence of Israel, providing moral and other support for terrorists and terror groups. Zoabi denies the charges. Balad has been informed that Zoabi may not run, and if she remains on the list, Balad will lose her seat to another party. Speaking before the hearing, MK Danny Danon (Likud) said that “Zoabi does not belong in the Knesset, but in prison. The court must do justice today and send her home. If Zoabi is allowed to run, the Court might as well just cancel altogether the law that allows the Knesset to ban individuals who are not loyal to the State from running.” Danon said that he planned to propose a new law in the next Knesset that would prevent people like Zoabi from running in future elections. “If the Court does not rule on the side of justice, we will have to pass a new law,” he said. Bishara, who was accused of giving sensitive information to Hizbullah that the terror group used against Israel during the Second Lebanon War, escaped the country before he could be arrested, and is today living in a Gulf Arab country.